A set of Mexican violins handmade using traditional woods (i.e. spruce for the soundboard, maple for the body, and ebony for the fingerboard) were studied. Standard mobility measurements of these instruments were obtained, and the sound of each violin was recorded when a professional musician played a Bruch Concerto opening excerpt. One of the violins showed a mobility with high harmonic content remarking strong components of high frequencies, resembling the response of old Italian violins, and particularly one made by Stradivari; its sound was the brightest of the set. Meanwhile, other violin exhibited an opposite performance, with weak components of high frequency and having the darkest sound. The performance of the third violin was located between the other two, both in mobility and in its sound. The sound recordings are available for download; so these discussions can be actively judged by the reader. 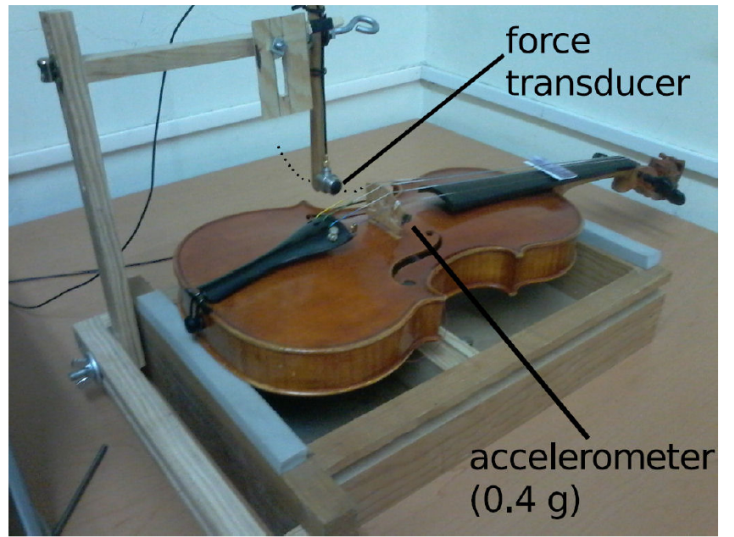 These Mexican violins covered a considerably different range of performance, so there is no reason to consider that violins made in Mexico could have some kind of limitation; quite the opposite, the results of this work show that obtaining a desired dynamical behavior (quantified by mobility measurements) of a new violin is totally feasible. All over the world, vibroacoustical data from several violins of different ages and provenance have been obtained; and even recently, numerical simulations of a complete virtual instrument are available 1. In fact, one clearly established goal has been stated by Marshall 2 about to create a catalog of violin vibration, with the aim to encourage comparisons of various types of behavior. At this respect, musical acoustics topics has been studied since some years ago in Mexico, but mainly focused in plucked instruments as the guitar (as a few examples see3,4) and the jarana jarocha5. Even so, some comments about the history of the acoustic of the violin were written by Boullosa 6 and, recently, one attempt to evaluate experimental violins of Mexican woods was published7. However, there is no related studies reporting measurements from Mexican classical violins made from traditional woods; i.e. violins that could be directly compared against other ones of standardized construction. From this perspective, the performance of Mexican violins could be considered somewhat unknown; which is a pity considering that several violins are made per year in Mexico (because this country has one of the few schools over the world where a Bachelor’s Degree in Violin Making can be obtained). Vibroacoustical data of Mexican violins would be useful, in order to compare their performance against equivalent data extracted from others violins widely studied. Nowadays, when analyzing stringed instruments, there are measurements typically included to relate vibration or sound radiation to the injected force (e.g. see the accelerance measured on a guitar 6). Of particular interest is the Bridge Mobility (sometimes called Mechanical Admittance) which in the rest of this paper will be simply referred as mobility. This measurement allows graphing the vibration of a stringed instrument, in terms of velocity per unit of input force to the system. Whereas the sound is directly proportional to the velocity of the radiating structure, the mobility contains information for an indirect estimation of radiated sound as Woodhouse and Langley have exhaustively detailed in Ref. 8. One of the main advantages of sensing structural velocity as output, instead of sound pressure, is that the room acoustics can be neglected and the general response of the measured violin is not compromised. For example, the famous plot by Dünnwald 9 of a set of violins, presumably of different qualities, was made relating radiated sound to a constant exciting force over the desired frequency range (obtaining radiativity); but the typical shape of the violin mobility obtained by other authors can be easily related to such plot. Basically for both mobility and radiativity, in low frequencies there are well defined peaks, while in high frequencies there is a broad peak centered between 2 to 3 kHz; which is especially clear for the old Italian violins group measured by Dünnwald. Specific settings of a widely applied experiment to obtain the mobility of the violin were stated by Jansson 10, and some researchers have adopted this experiment as standard. In consequence, mobilities of several highly valued violins are reported in papers; including Old Italian instruments made by Guarneri and Stradivari. Also, there are useful commercial recordings containing musical passages played with this kind of instruments, e.g. the systematic recordings of Ricci 11 playing the Bruch Concerto opening excerpt with several old violins (even though the set-up during recordings and post-processing of commercial material is usually unknown). Therefore, the present paper is focused on obtaining the mobilities of some violins made in Mexico, complemented with sound recordings of them under controlled conditions and some subjective comments. The aim is comparing this data with equivalent information available in the literature, in order to determine if the dynamical behavior of these violins, created away from European schools, is similar to data obtained from traditional violins. Considering that, for subjective evaluations, it is recommended to restrict the amount of instruments to a small number 12 (e.g. Boullosa et al. 3 only used four guitars for subjective tests), three particular violins were selected for this work. The preliminary criterion for the selection was that the three violins have presumably different timbres, from bright (high amplitudes of harmonics of high frequency) to dark (high amplitudes of harmonics of low frequency), and each one was made by a different maker. The materials used for the instruments were woods traditionally used in violin making; i.e. spruce was used for the soundboard, maple for the body, and ebony for the fingerboard. The three violins were prepared for testing with the same type of new strings. Two of the violins were made by students and completed in 2014, and both designs were based on the Cremonese violin of Stradivari; the internal control labels are v308 and v264 and hence they will be referred in this way. Another violin has v171 as internal control label and it has a prehispanic face instead of scroll. This last violin was made in 1987 by an experienced violin maker, the founder professor of the school, Luthfi Becker; who also adjusted the soundpost (away from the center and cutting it) a few days before to measurements. The mobility up to 5 kHz of a 1709 Stradivari violin (hereafter referred simply as Strad) is shown at top of Fig. 5. Such test was made by Durup and Jansson 13 and they marked P1, P2 and BH assuming these features as relevant in the quality of a violin. Figure 1 Experimental set-up for the mobility measurements. Figure 2 Harmonic content of the driving force obtained through the set-up of the experiment. Figure 3 Two measurements of the mobility of v308. In the first (solid line) the resolution is 12.5 Hz covering 5 kHz; in the second (dashed line), the violin was retired of the experimental set-up and reinstalled, and the resolution is 2.5 Hz. Figure 4 Recording session and the played score for each violin. P1 and P2 have been widely studied for several researchers; however, there are no consensus for naming these resonances. For example, the most used way to labeling these modes is B1- and B1+ respectively; but Rossing 14 has proposed updating the names to C2 and C3. In the present paper, the labels P1 and P2 were chosen simply to avoid altering the original figure corresponding to the Strad. Gough 1 have clearly showed how these two low modes (whose shapes are available in Ref. 2) are strongly perturbed by the air within the cavity, its coupling to the bending component mode and the soundpost coupling strength and position. Particularly, the mode shapes corresponding to P1 and P2 are remarkably different to the corresponding of instruments without soundpost, as the guitar and the jarana jarocha (low modes of these last instruments are available at 4,5,6). Respect to the hump known as Bridge Hill (hereafter simply referred as BH), it is an important behavior not found in the mobility of instruments like the guitar or the viola da Gamba 8. In the last decades, a lot of papers inspired in findings of Jansson have been focused to explain the importance of BH in the quality of the violin. Even though BH retains several unexplored issues, it appears that its relevance is recognized. The mobility of the violins of the present paper was measured following the experimental procedure used to obtain not only the mobility of this Strad, but also of many other violins measured in recent years obtaining similar graphs, a few examples are found in Refs. 7, 8 and 15; so the mobility of this Strad (Fig. 5 top) will be used as a standard for comparison with the results of the present work. Figure 1 shows details of the experimental set-up here used. The experiment to obtain the mobility consists of hitting the bridge in the G-string corner, through a pendulum of the same length as the used by Jansson (120 mm). A IEPE force transducer was screwed at the end of the pendulum to sense the impact. 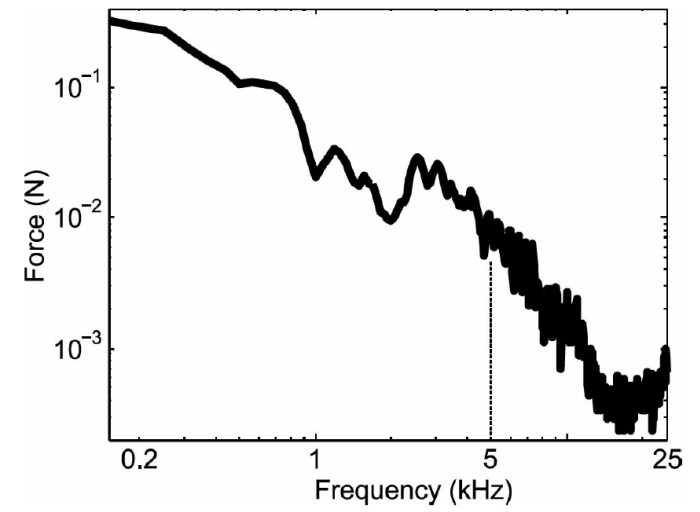 A polymer tip was attached in the transducer to produce an adequate harmonic content for the input force, covering the required frequency range up to 5 kHz as it is shown in Fig. 2. The generated signal was captured in one channel of a dual IEPE channel spectrum analyzer. Meanwhile, the other channel is confined to sense the vibration in the E-string corner through an ultra-miniature IEPE accelerometer (0.4 g) connected via a very thin pair of cables (instead of the widely used coaxial cable). The vibrations of the strings were avoided with a card but without touching the fingerboard, as it is shown on Fig. 1. Eight cycles of the experiment were averaged to obtain each mobility. To cover the required frequency span (up to 5 kHz), the resolution in the analyzer had to be fixed with steps of 12.5 Hz. Although this value for the resolution may appear too coarse to allow detecting important resonances, an additional measurement with resolution of 2.5 Hz (which implied lowering the range up to 1 kHz) revealed that 12.5 Hz of resolution is enough. Figure 3 shows the mobility of v308 measured with both resolutions. Clearly, almost the same resonance frequencies can be detected from both mobilities. Also, the repeatability was verified at the same time because v308 was measured up to 5 kHz and retired of the experimental set-up; the next day, v308 was measured again only up to 1 kHz and practically the same mobility was obtained. Even the mobility of v308 included in Fig. 5 was taken almost a year apart and the shape remains the same. Undeniably, the Bruch Concerto opening excerpt, recorded during several sessions by different people (e.g.11,15), is a good choice to analyze sound features of violins because a wide part of the violin tessitura is played. The score of this fragment is shown at Fig. 4, and it was performed by an experienced musician of the Philharmonic Orchestra of Querétaro, Professor Arshak Hayrikyan, using the violins of this work. The only indication for the musician was trying to play the three violins equally, but a metronome was not imposed to allow some freedom during the performance. The excerpt was recorded in one long take, twice for each violin. 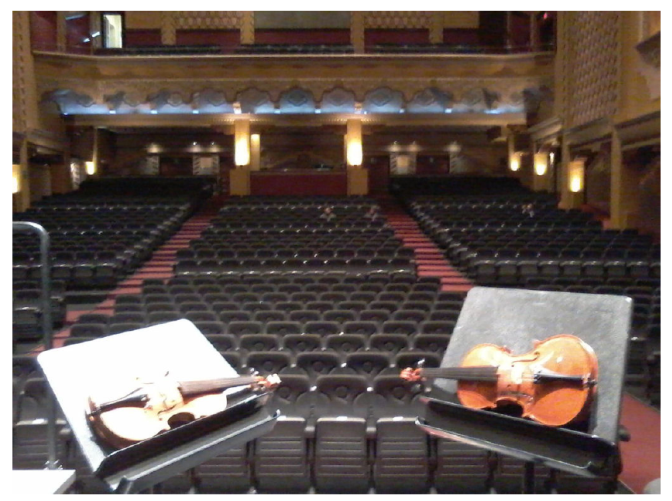 The recordings were made keeping the same conditions for each violin, in a small anechoic chamber (Fig. 4). In order to create stereo files from a similar position of a human head; two condenser microphones were used and they were spaced by about 13 cm, 1 m from the musician and 1.3 m above the floor; their signals were sent to a computer via USB, using a phantom interface at a sampling rate of 44.1 kHz and 24 bits. Sound-editing software was used to create two types of files in WAV format: one containing the excerpt played with each violin with one microphone per channel, and the other type containing two different violins as explained below. To create the audio files containing two different violins, the recordings exhibiting the best temporal synchrony after comparing the data of each violin were found; and then these chosen recordings were mixed as follows: the left channel contains the signals from both microphones of one take using one violin, while the right channel contains the corresponding data of other violin. So three files were created and named according to the stereo set-up: L264R171, L308R171, and L308R264. The spectrograms of the selected files for these mixes were calculated for each channel to analyze the harmonic content obtained with each violin. The results obtained from v171, v264, and v308, did reveal typical behaviors in violins, although the mobility of each instrument had distinctive features. Along with the audio files of each violin, some discussions of these results are explained below including some subjective opinions in Sec. 4. Figure 5 shows the magnitude of the mobility of the analyzed violins. A naked eye comparison shows that the mobility of v171 is, by far, more similar to the mobility of the Strad than the other two violins. While the f-hole resonance (about 275 Hz) and P1 clearly appeared in the three mobilities, the mobility of v264 and specially v308 showed differences in comparison with the Strad data as the frequency increases. First, differences in lower-order vibrational modes of violins seem relevant considering the importance attributed to this issue in the literature (e.g.1,2,13). The amplitude of P2 for v264 and v308 is considerably low, even in the high-resolution mobility for v308 in Fig. 3. Maybe just adjusting the soundpost position of v264 and v308 might have been enough to enhance the response of P2 1, but any modification to the violins was intentionally avoided once the measurements started. In contrast to v264 and v308, P2 is the highest peak for the lowest modes of v171 as well as in the Strad. In the next group of resonances around 1 kHz, v264 and v308 had considerably large amplitudes (even higher than P1 in the case of v308) unlike the behavior of v171 and the Strad. Finally, above 1 kHz the mobility of v308 exhibited a somewhat lower response; and BH appeared in v264 centered on 2 kHz. However, v171 and the Strad clearly show prominent amplitudes for a BH centered around 2.5 kHz (although the frequency for BH in v171 seems slightly higher than the Strad). Therefore it is clear that, unlike v171, the vibrational behavior of v308 is far from working as this Strad, especially in an relevant range for the violin sound as Jansson 15 has remarked because it falls where the human ear is very sensitive ( ≈1 to 5 kHz). The mobility of v264 can be considered as an intermediate case between v171 and v308. As an additional criterion to catalog these three violins based on performance, their mobilities were sorted according with the Dünnwald responses 9 (Italian violins at top, master instruments at middle and factory violins at bottom). The matching criterion was the highest value of the responses for both works. Thus, since v171 has the highest value of its response at BH as the old Italian violins, its mobility was placed at top of Fig. 5. Meanwhile, v264 has high values over the whole mobility as the master instruments of the middle; and the highest value for v308 is around 1 kHz as the factory violins at bottom of the plot. The six audio files created for this work, available on the web16 and by request to the author, allow various types of analysis. The distinctive sound of each violin can be heard alternately panning the mixed audio files (L264R171, L308R171, and L308R264) while they are played, no matter which violins are being compared. Note that the timbre difference between each one can be heard at any instant of any of the musical excerpts recorded in this work, in both low and high notes. Besides, it is clear that the repeatability achieved by the professional musician was good enough to synchronize three different violins, mixing the executions in a single audio file. The timbre difference between the three violins is evident, even more than the detected differences when comparing the violins recorded by Ricci 11 (perhaps because all the violins used by him can be considered of somewhat similar qualities). Clearly, the sound of v171 is the brightest while v308 has the darkest sound. This is also revealed by viewing in a real-time frequency analysis (e.g. “Fire Storm” in the “Bars and Waves” section of Windows Media Player) each audio file that contains only one violin; all the time, v171 amplitudes at high frequencies tend to be stronger than v308 and it is already known that the harshness of a violin is associated with a strongly increased level between 1520 - 3040 Hz12. In agreement with the mobility data, the sound of v264 can be considered as an intermediate case between v171 and v308. For a more detailed comparison of the harmonic content of the sound generated by each violin, Fig. 6 shows the spectrograms of the excerpts recorded. For each one of the three spectrograms, the amplitudes were normalized with respect to the maximum value of the data of the corresponding violin. Also, to facilitate the comparison with the mobilities of Fig. 5, x-axis of Fig. 6 has preserved the logarithmic scale and its limits from 0.1 to 5 kHz. Figure 6 Spectrogram of the Bruch Concerto opening excerpt recorded using the three violins of this work. 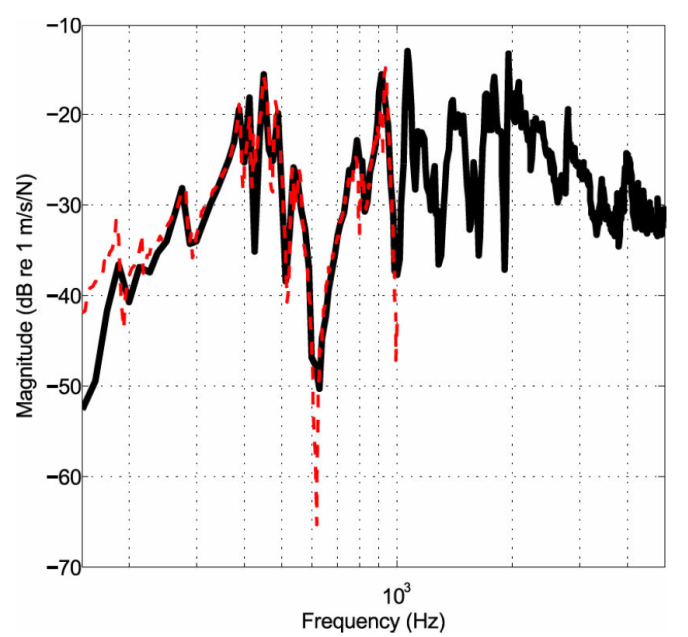 For frequencies below 700 Hz (around P1 and P2), there are few significant variations between the spectrograms of the three violins; despite the differences between the mobility of each one for these low frequencies. However, variations on the harmonic content are apparent becoming more evident with increasing frequency, similarly to the differences of their corresponding mobilities. Near to the group of resonances around 1 kHz, the spectrograms showed that the amplitudes of the harmonics have different proportions playing the same notes using a different violin. There is no a clear pattern to link the mobilities with the sound measured for this frequency range. It seems that the behavior of v264 exhibited more differences in comparison with the spectrograms of the other two violins (cf. peaks around 900 Hz in the data of the three violins). Finally, in frequencies corresponding to BH, the spectrogram of each violin looks very different with respect to each other (like the mobilities): on the one hand, the sound of v308 contains low amplitudes; on the other hand, the sound of v171 has high amplitudes showing a clear agreement with the sound spectra reported by Jansson 15 when playing violins with high values in BH. One more time, v264 can be interpreted as an intermediate case between v308 and v171. Therefore, the spectrograms clearly showed the sound differences between the three violins (especially in the BH range). The highest ratio of vibration per unit of input force of the analyzed violins is clearly different as it was expected, considering that the three violins generate a distinctive sound. However, now this has been clearly demonstrated through measurements. The next step would be evaluating the performance of the three violins in a concert hall, and undoubtedly, the main interest would be analyzing the behavior of v171 in such place due its affinity with the Strad. In addition to this affinity, there are objective reasons to believe that the sound of v171 has great chances to fill a large concert hall; for example, its mobility reveals that a considerable part of the injected energy to v171 will be efficiently employed for sound generation in a frequency range of high sensibility of human hearing (around 2.5 kHz). Exhaustive procedures to investigate the performance of these violins in a concert hall are required, but this latter topic is beyond of the scope of this work. However, it is worth mentioning some subjective evaluations collected over the course of this work. The live-played violins and their sound files have been continuously heard by many students and teachers of the Violin Making School, both in the Acoustic Laboratory and in a classroom; these places are small rooms of about 2.5 x 5 m and 6 m high, exhibiting a considerable reverberation. Typically, v171 was compared directly against v308 as violins of contrasting harmonic content. Under these conditions, the v308 timbre was usually labeled favorably for being more mellow than v171; contrary to the expectations after finding that the mobility of v171 seems to be behaving as the data of a high quality instrument. This was intriguing, and since it is also feasible that the reader may be in a similar situation after hearing the files, one last subjective test was included. The performance of v171 and v308 was evaluated by two students and two professors (one of them scarcely related with music) from the school, but in a concert hall in Querétaro (Teatro Alameda). Without public, the author of this work played the excerpt using each violin from the main stage; certainly with the technique of a beginner, although consistently for both violins. Meanwhile, the four evaluators were seated far enough so they could not visually distinguish the instruments (in row 20, see Fig. 7). Under these conditions, all of them preferred the sound of v171 (ignoring which instrument was), commenting that his/her opinion was based on the perception that the other violin (v308) tended to be inaudible. Figure 7 Teatro Alameda. A picture taken from the place where v171 and v308 were played, where the location of listeners can be observed. Finally, one of the students played both instruments in order that the author of this paper listened to them in different parts of the hall. Apparently, the higher harmonic content in the v171 sound allowed to cover the concert hall in a better way than v308, whose sound seemed not to have enough power to be heard in such a large hall (Fig. 7). These discussions are consistent with the fact that the mobility of v171 is similar to the typical mobility of high quality violins, which are used by concertmasters in large halls. Even so, it must be stressed that this last evaluation must be interpreted only as a preliminary result and more formal procedures are still required. 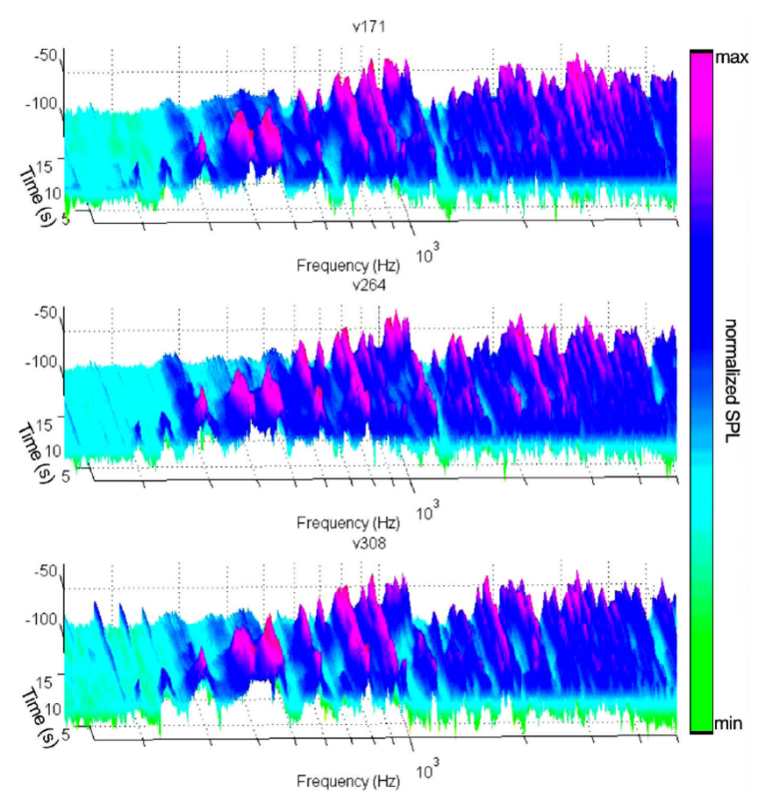 Marked differences were heard and displayed (by spectrograms) when comparing audio files of three Mexican violins, which were clearly linked to the differences between the mobilities of each instrument. On the one hand, one of these violins, v171, has a mobility remarkably similar to a Stradivari violin; its sound was the brightest having good amplification of harmonics between 2 and 4 kHz, as might be expected from the clear hump in its mobility in the BH range. On the other hand, v308 presented a completely different behavior than v171: beyond 1.5 kHz, the mobility of v308 was lower instead of showing the BH and its sound exhibited a much lower harmonic content; in consequence, the sound of v308 was the darkest of the three (the behavior of v264 was labeled as an intermediate case between v171 and v308, in both mobility and sound measurements). Additionally, preliminary subjective tests comparing both violins suggested that v171 seems more adequate for a concert hall, but v308 was preferred on small rooms. Therefore, this analysis on three Mexican violins have shown that their sound can cover a wide range of tonal qualities, from dark to bright; and these judgments can be evaluated by the reader because sound files comparing a musical passage played with each one are available for free download. On this way, this paper are also trying to promote the inclusion of musical recordings of analyzed instruments in research papers, considering that nowadays obtaining sound recordings (and sharing) is easier than a few years ago. Since the mobility of these violins made in Mexico can be closely similar to particular instruments taken as reference (as the Strad here mentioned), and keeping in mind that traditional woods are used in such country for violin making, there is no reason to think that the behavior of Mexican violins could be limited by any factor. 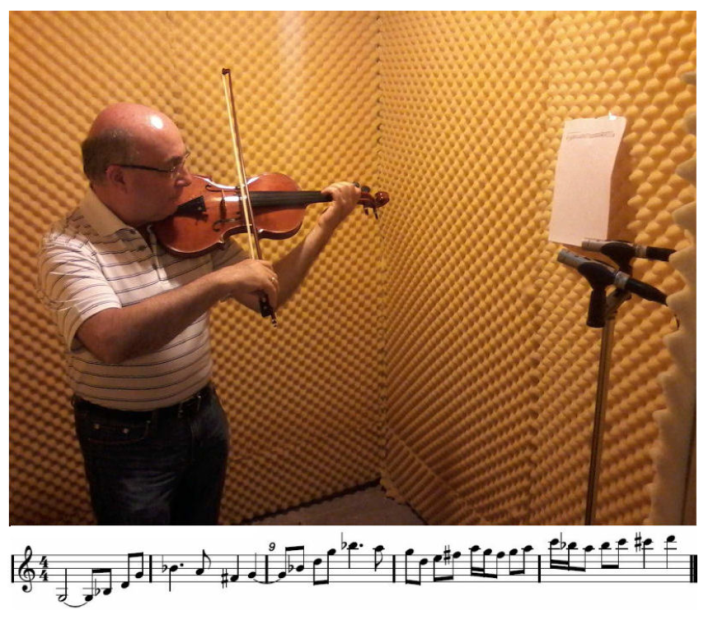 The author would like to thank Professor Arshak Hayrikyan for playing the violins for recordings, to Durup-François Faure of ENSTIB by agreeing to share the 1709 Strad measurements performed with Erik V. Jansson at KTH, and to violin maker Luis Lavalle and Dr. Joaquín Quiroz for their valuable comments about the subjective evaluations and their participation in such tests.